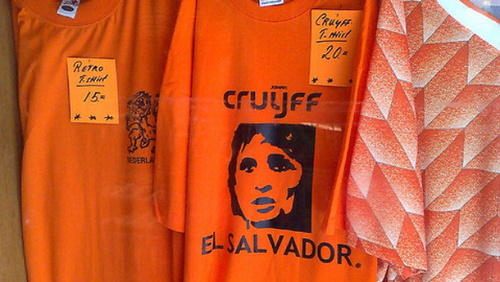 Johan Cruyff’s ambitions to coach the Dutch to World Cup glory at Italia 90 were scuppered by Oranje’s most successful manager, Rinus Michels, according to a new biography. The 1990 tournament was an ill-fated one for the Netherlands, who arrived in Italy as one of the favourites, only to go out in a bad-tempered second-round match with West Germany. Images of Frank Rijkaard spitting at German striker Rudi Voller as both players left the field after being sent off became one of the most notorious images of an ugly World Cup. Michels, who coached the 1974 World Cup team in which Cruyff starred as well as the 1988 European champions, overruled a players’ vote endorsing Cruyff as the successor to Thijs Libregts. Instead he chose Ajax coach Leo Beenhakker, who led a team brimming with talent to the country's worst performance at a World Cup finals tournament. Football fans and historians ever since have been left to wonder what might have been. Michels’ biographer Bas Barkman recounts how the former coach, who was in charge of technical affairs at the Dutch football association the KNVB, gave the players three options after they effectively staged a coup against Libregts. Eight of the 15 players, including Marco van Basten, Ruud Gullit, Frank Rijkaard and Ronald Koeman, voted for Cruyff, who was then flying high as manager of Barcelona.